Get Training For MEWPS. It’s The Law! Whilst powered access platforms make working at height safer, quicker and more efficient, it must be remembered that employers or individual users are liable if the people in charge of the machinery are not properly trained. Health and safety legislation and work at height regulations make training for MEWPS compulsory. Anyone working with the equipment needs to know how to inspect it, to operate it safely, and to recognise and avoid any potential hazards. As well as this general training, they should also be given familiarisation training on the specific model that they will be working with. What’s the MEWP training about? Accredited training centres are located across the country and courses can be held at their premises, or on a convenient site with suitable facilities. Promax Access offer a wide range of training courses for working at height. Please call to discuss your particular access platform training requirements. In 2010, aerial work platform industry professionals published ‘The Statement of Best Practices of General Training and Familiarization for Aerial Work Platform Equipment.’ This document sets out the obligations and requirements of those responsible for delivering, arranging and receiving training in the use of powered access platforms and is essential reading for anyone planning a job at height with powered access platforms. Powered access platforms have many benefits for working at height but there is a legal obligation to make sure they are used safely and properly. Training for MEWPS is not only a legal requirement but jobs can be completed more efficiently if everyone involved knows how to use the equipment properly. With professional training dangerous and costly accidents can be avoided. In addition to the usual safety concerns for the workforce, it can be complicated to get the necessary equipment to the work area, let alone set it up and start using it. A spider platform often needs to be transported through a tight space and set up, taking care not to damage the surrounding environment and making sure the machine is fully operational and safe despite these additional limitations. Our spider platform range has been specially designed to work in areas that are inaccessible to other powered access platforms and to provide maximum functionality, indoors or in tight spaces. 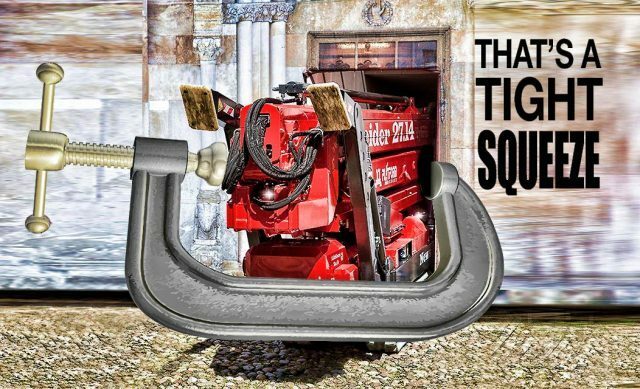 The name comes from the shape of the stabilizer legs which fold up to enable the lift to be used in narrow spaces and to pass through standard width doorways or gateways which would be problematic for other types of lift. This clever design does not mean a compromise on the overall functionality of the lift as they are still able to safely reach significant heights, and have strength and stability on uneven and sloping surfaces. • Electric motor power option for indoor use which reduces operational noise. • Not only lower overall weight than other types of access platforms but also no reduced functionality. The narrow design and low ground pressure make them flexible and reliable on delicate surfaces, both indoors and outdoors. The spider platform legs can even be set up in different positions on different ground levels meaning the machines can be used in compact spaces where other lifts are unable to work. Spider lifts are the least disruptive type of powered access platform making them flexible and adaptable for a range of unique and specific jobs. They have reduced noise, flexible access and can be used on most surfaces without compromising safety, functionality or causing damage to more delicate surfaces, even in the most unusual spaces. See our full range of Spider platforms, please see our tracked spider lift access platform page which has all the information you will need. Boom type MEWP safety is a concern to anyone working at height with these types of access platforms. However, for the occupants of the basket in a boom type MEWP there is a real risk of serious injury or death from being catapulted out of the basket. They may not be in any position to avoid violent movement of the basket. But the correct use of a harness can prevent them from being thrown out. • Even a small movement at ground level will create a whiplash effect at platform level. • The higher you are, the faster you will be thrown forwards – or sideways – or backwards. • In the event of an accident, the platform might tilt – providing less protection than you think. When working from a boom type MEWP (mobile elevated work platform), it is strongly recommended that a full body harness with an adjustable lanyard be used to provide work restraint. The lanyard should be adjusted to be as short as possible and may contain an energy absorbing device. This includes Static Booms and Mobile Booms. Where there is a risk of impact or someone falling from a boom type MEWP, those people should wear appropriate fall prevention equipment. The preferred option is to stop the person falling from the work platform by using a work restraint system. A work restraint system will consist of a full-body harness (BS EN 361) connected to a lanyard (BS EN 354) which connects to an anchor point on the MEWP basket. From the anchor point, the lanyard length will be short enough to prevent a person reaching a position where they could fall. The lanyard may contain an energy-absorbing device (BS EN 355), but will still only be in use as part of a work restraint system. Do not use retractable type fall arresters (BS EN 360) unless they are suitable and have been specifically tested. British Standards safety equipment may be bought online and delivered the next day. It is also worth downloading and reading what the “Work at Height Safety Association” have to say in their Technical Guidance Note 4 “Guidance on the use of single and twin energy absorbing lanyards”. It can be downloaded here . Clunk Click is a worldwide campaign for all users of boom type platforms. It encourages operators to wear a full body harness and also a short lanyard. It was started in the UK by the Powered Access Interest Group (PAIG). PAIG are a joint committee which includes, not only the Construction Plant-hire Association, but also the International Powered Access Federation. Clunk Click stickers for boom type MEWP safety can be ordered by calling +44 (0)1271 374209. Artwork can also be obtained from IPAF on +44 (0)15395 66700. Be safe at height. It’s your life. The Duke of Wellington was one of Britain’s finest generals. His success in India, Spain and Europe was down to one thing: reconnoitring the ground. This was so important to him he carried out much of it himself. Seeing the ground with his own eyes allowed him to plan for troop and artillery placement, to check on the ground conditions, and allow quick access to areas when needed. In effect, he did his own ‘risk assessment’ before each battle. He would have made the perfect MEWP team manager. There are many factors to take into account when planning to use powered access platforms. To ensure their safe and effective use, good decisions need to be based on understanding where and how they are to be used. The best way to identify the hazards is to travel beforehand – to reconnoitre – the route the MEWP will take. From where the MEWP is stored to the site entrance needs to be seen and the most suitable method of transport chosen. If on a trailer, a safe area needs to be designated for unloading. Accidents can and do, happen at this stage. – Visibility is paramount when moving machines around and vehicles should have large, clean windscreens and external mirrors to provide an all-round field of vision. If it has recently rained then reconnoitring the ground is essential to assess the risk. 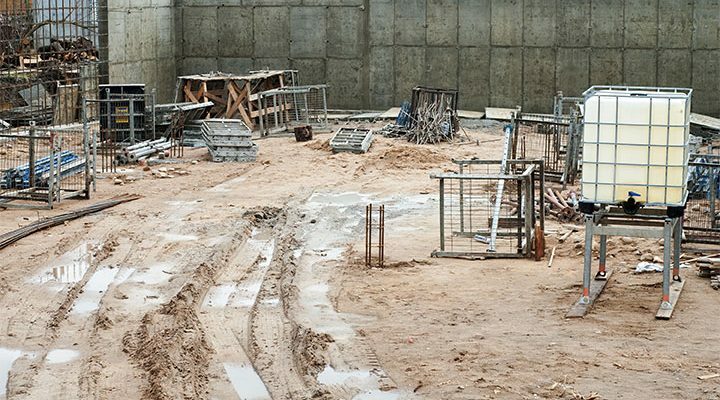 Soft surfaces can make manoeuvrability difficult, particularly when the ground has become muddy and churned up or if you are working on different surface types such as sand, ice or fragile indoor floors. Check the condition of surfaces in all of the work areas and in between and factor in the machine weight as, in some cases, a tracked access platform might be required. Viewing beforehand the route the MEWP will be taking from the start of its journey to the work placement will make the HSE “5 Steps” easier to assess. Take a tip from the Duke of Wellington – do your own reconnoitre and assess the risks when deploying your MEWPs.